The accelerated pace of today’s battlespace requires military leaders to build strategies and make decisions in a much shorter timeframe. The speed of war requires assessments and actions in near real time which introduces new risks to the rules of engagement. To support military leaders, today’s operators are required to mine through vast amounts of data. The ability to quickly process and understand this information is a significant challenge. There is a clear requirement to improve the human-machine interface to allow simple, natural, collaborative data visualization for a quicker informed operator decision. Battlespace is a 3-dimensional environment. The ability to exploit this data and intuitively visualize in 3D all elements of the operational environment will improve the operators’ capability to act with precision, certainty, and expediency. The emerging light field display (LfD) technology provides a glasses-free holographic image with all the required natural depth cues for a natural visualization capability. Because a light field is perspective correct for all viewers within the view volume, the ability to rapidly understand and collaborate over a common operational picture greatly increases time to action. Unlike glasses or head/eye tracking display technologies, LfDs do not cause nausea, eye fatigue, or headaches allowing for prolonged use. Recent studies conducted by the Army and Air Force Research Laboratories have proven LfDs reduce the cognitive burden and enable quicker decisions with greater confidence by the user(s). 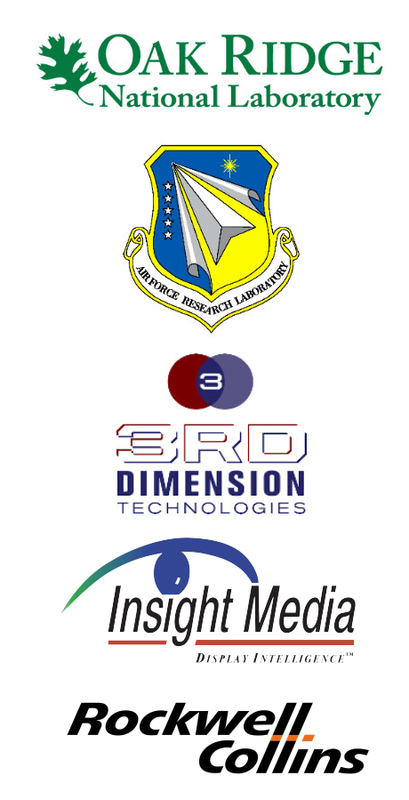 DOD with industry is developing an advanced dynamic light field display system with a deeper, richer image over the previous DARPA funded prototype system used and evaluated by ARL and AFRL. To address the requirement for real time interactivity, a dedicated light field processing unit is currently in development to reduce the size, weight, power, and cost of radiance image computation. A base graphical language is being defined and developed to reduce the man power required to use and maintain visualization systems. This base code will allow for a single application to drive multiple types of displays (Augmented Reality/Virtual Reality/Light field) allowing the warfighter to use the device best suited for the objective. With the use of emerging display technologies, today’s warfighter will be best equipped to visualize the fast paced and complex battlespace in a natural intuitive way. The light field display allows for a deeper understanding of complex data accelerating the ability to quickly receive, discern, and act providing for a safe deployment and the ability to defend and protect the nation’s interests. Nilo Maniquis is the lead PEO IWS ship systems and integration engineer for the 30 Year Combat Power Plan for Surface Navy including Future Surface Combatant and the Flexible Warship’s Concept and Design. Previously, Mr. Maniquis was the Deputy Major Program Manager and senior non-uniformed member of PEO IWS 1.0, where he was responsible for leading all aspects of life-cycle management for numerous weapon systems. He earned a Bachelor of Science in Mechanical/Aerospace Engineering from the Illinois Institute of Technology.